Published studies that have examined the use of lactoferrin as a supplement and its beneficial effects on immunity have been quite promising. First, lactoferrin helps to maintain a proper level of “good” bacteria in the intestinal tract, while controlling the number of “bad” bacteria. 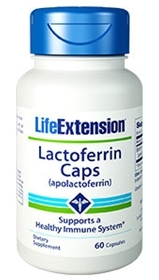 Probably lactoferrin’s best-known role is as an iron binding protein. The mechanism appears to lie with lactoferrin’s ability to bind iron, as it is known to have an extremely high affinity for this metal. There is little doubt that lactoferrin is a major find and a potential breakthrough as a natural nontoxic immune enhancer. Though a handful of companies are able to produce lactoferrin at this time, there is only one company producing the apolactoferrin (iron-depleted) form in large quantity. Studies suggest that the superior form to supplement with is apolactoferrin. Other ingredients: microcrystalline cellulose, gelatin, water. Contains milk. This product contains NO egg, fish, peanuts, crustacean shellfish (lobster, crab, shrimp), soybeans, tree nuts, wheat, yeast, gluten, corn, or rice. Contains NO sugar, and no artificial sweeteners, flavors, colors, or preservatives. Take one daily with or without food, or as recommended by a healthcare practitioner.